Oh, how we wish that were so! However important it is to clarify and state an intended outcome (we have written a number of essays on the subject in the past few months), that is only the first step - and an important one - in the creating process. However, in order to move toward what you want to create, you must also be clear and honest about the current reality you face in relation to that outcome. Imagine that we take you on a helicopter and drop you off somewhere in the Desert Southwest of the U.S. We give you all the resources you need, including food, sufficient water, a map and a compass. We then say that the outcome is to make your way to, let's say, Las Vegas. " Would you be able to do so?" he asks. The point is, without knowing where you are on the map in relation to Las Vegas, your chances of heading in the right direction, he says with a twinge of humor, is a "crap shoot." You must tell the truth about where you are in relation to where you want to go (or what you want to create). A wise person once observed, "What determines your destiny is not the hand you're dealt, but how you play the hand. And the way to plan the hand is to see reality for what it Is and to act accordingly." Doing so requires an objective, non-attached assessment of what is going on that supports, or is helpful, in creating your outcome, as well as the problems, obstacles, and challenges that inhibit, moving forward. This balanced evaluation of current reality is critical to determining the Baby Steps that you can take toward leveraging what is going well, getting to "root cause" and solving the problems that stand in the way, and/or taking new generative action toward what you want to create. Telling the truth about current reality is as important as setting the intention. If you would like to post a comment about this article, please visit our blog. Two day TED* Training Nov. 8-9 in Vancouver BC for those who want to take a Deeper Diver Applying the TED* Framework in Life and Work. Sign up before Oct. 1 and receive an Early Bird registration special! The spread of TED* continues! If you would like to have David Emerald or Donna Zajonc speak at your next event or to sponsor a TED* workshop in your community, contact us: DEmerald@powerofTED.com. 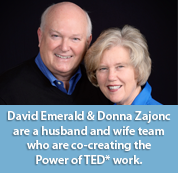 David Emerald and Donna Zajonc are a husband and wife team who are co-creating The Power of TED* work. Available on Amazon, Amazon Kindle, on all major e-book systems and through bookstores. 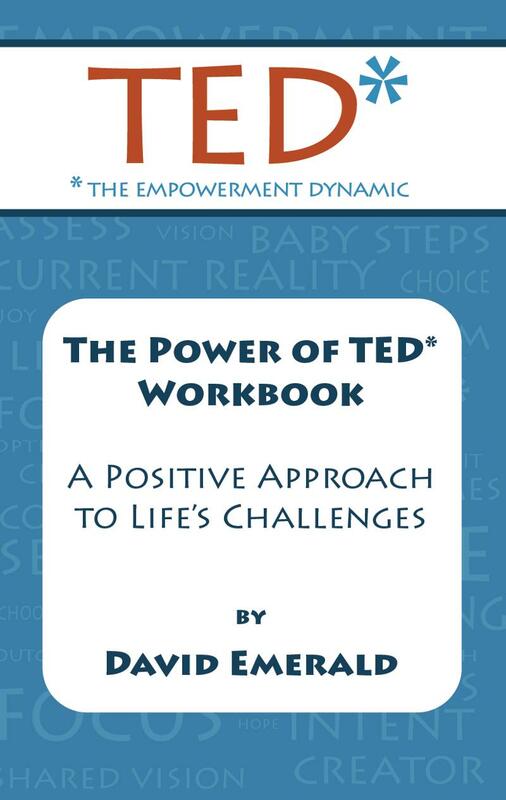 If you just want The Power of TED* Workbook, you can find it here. To the Creator in you! The "TED* Works! ™," is an electronic newsletter (e-zine) that focuses on applying TED* (*The Empowerment Dynamic) ™ to work and life. TED* (*The Empowerment Dynamic) and The Dreaded Drama Triangle (DDT) ™ are models that are Trademarked by the Bainbridge Leadership Center and The Power of TED*. The DDT is derived, with permission, from the Karpman Drama Triangle, developed by Dr. Stephen Karpman. This newsletter is written and edited by David Emerald and Donna Zajonc © 2013, with all rights reserved. Please feel free to send this newsletter in its entirety to anyone you think might like it. If you would like to reprint the newsletter for other than your personal use, you are invited to do so, provided you keep the content intact without any editing and attach the copyright notice to our material. This material may not be sold to others. When we focus on the question, "What do I want?" it is common to set goals. In the TED* (*The Empowerment Dynamic) ™ work, we encourage putting your focus on setting outcomes more than setting goals. "I will lose 20 pounds"
"I will get out of debt"
"I will stop fighting with my partner"
Goals are concrete steps based upon something we don't like and wish was different about our life. When we focus on what we don't like, our reptilian brain kicks in and immediately gets defensive. For example, if you think about losing 20 pounds, you subconsciously say to yourself, "I don't like my body. I know I shouldn't eat this or that." Without realizing it you are making yourself a victim of your own thinking---focusing on what you don't like or don't want. This pulls you into the reactive Victim Orientation and tends to set up the Dreaded Drama Triangle (DDT) ™. "I choose to focus on optimal health and eating"
"I choose to create financial freedom"
"I will listen to and respect my partner"
Goals are what you do. Outcomes are a way of being. To help clarify your outcome, a powerful question to ask yourself is, "If I accomplished this goal, what would it allow me to do, be or have?" Once you answer that question you can focus on goals in service to the true outcome you want for your life and work. Take a break from focusing just on concrete goals. Rather than persecuting yourself for not reaching your goal, focus instead on defining the language that describes what you really want. Doing this will give yourself a better chance of creating the life really you want. Your brain, and YOU, will love the difference. This newsletter is written and edited by David Emerald and Donna Zajonc Ã�ï¿½Ã�Â© 2013, with all rights reserved. Please feel free to send this newsletter in its entirety to anyone you think might like it. If you would like to reprint the newsletter for other than your personal use, you are invited to do so, provided you keep the content intact without any editing and attach the copyright notice to our material. This material may not be sold to others. Shifting out of the Dreaded Drama Triangle (DDT) ™ toward the more resourceful roles of TED* (*The Empowerment Dynamic) ™ requires that we always, always start with one important question. We will explore that vital question in just a moment, but we first want to share the reason this question is so important. To illustrate this point, think of a time you looked at a map and were trying to figure out the directions of how to get where you wanted to go. You must have two basic points on the map: (1) where you are and (2) where you want to go. Right? One reason many people get pulled into the DDT and feel victimized by their current situation is because they don't clarify where they want to go. They look at their life map and say: "I feel stuck right here, where I am." They only focus on all the problems and circumstances of their current realty. When we don't know where we are supposed to go we cannot move from where we are to a new desired location on our life map - personally, professionally, in intimate relationships, etc. This fundamental idea of moving from Point A to Point B on a map is why so many people get stuck on their life journey. We have to know where we want to go. That brings us to the question you always, always ask first: "What do I want?" And, what you want CANNOT be what you already have because that is "Point A" on the map. It also cannot be to merely get rid of, or away from, a problem in your life or work. The answer to the question must be a future state that you want to create or the enhancement of something you want to improve. This is the basic role of the Creator in TED*. The Creator pulls us forward toward what we really want. Without the Creator role, we fall victim to relinquishing our dreams. The late Stephen R. Covey always taught to "begin with the end in mind." Asking the first and most important questions of "What do I want?" or "In what direction do I want to grow?" places our focus on the envisioned outcome we want to create. If you shift your focus to what you want, and put your energy on that, you will make progress toward creating it in your life and work. This newsletter is written and edited by David Emerald and Donna Zajonc Ã�Â© 2013, with all rights reserved. Please feel free to send this newsletter in its entirety to anyone you think might like it. If you would like to reprint the newsletter for other than your personal use, you are invited to do so, provided you keep the content intact without any editing and attach the copyright notice to our material. This material may not be sold to others. In our last newsletter we outlined many of the characteristics of the Rescuer in the Dreaded Drama Triangle (DDT) ™. This week we want to describe the Pleaser,which is one of several different styles the Rescuer tends to take on. Pleasers are not just invested in the lives and happiness of others-it becomes their primary focus in life. It may be the PTO committee that consumes a Pleaser because they cannot say "no." Or they may take-on more duties at work than is there's to do. The Rescuer as a Pleaser feels responsible for other people's happiness and therefore often say "yes" to every need and request even when they would rather say "no." Pleasers swallow their own feelings so as not to rock the boat. Remember, Pleasers feel an obligation for other's happiness over theirs. They may wind up with way too much to do and may endure even sickness so not to let others down. Their intentions are good but with a long list to accomplish they feel the only thing to do is to work harder and faster, furthering their exhaustion. Sometimes Pleasers are not able to get everything done but others will play along knowing the Pleaser's feelings might be hurt if any one speaks up. Consequently, the Pleaser attracts people who are willing to play along---all in the name of being dishonest about what is really going on. Usually feels overwhelmed and exhausted with all there is to do and not enough time. Feels guilty and shameful if they cannot fix everything. On-guard for disappointing others so they may have trouble making decisions. Guilt, not generosity, is often the motive for their actions since they feel responsible for other people's happiness. May tend to suffer and complain because they are not willing to disappoint anyone. Often on the losing end of an intimate relationship because they are over-invested in making their partner happy. Their partner feels smothered or the Pleaser never feels their needs are met. By pleasing others, Pleasers don't have a chance to ask themselves what they really want. "Who am I?" is not available to Pleasers because they reside in "I am who others say I am." There's a reason the airlines ask us to put the oxygen mask on first. We cannot assist and be in service unless we first learn to take care of ourselves. 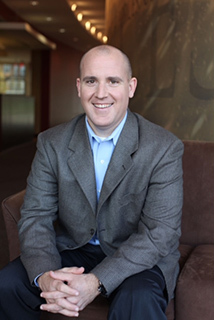 TED* (*The Empowerment Dynamic)I am interested in purchasing a Denali bundle for a site I am developing that is a combination of info pages and real estate listings. Can non-listing pages be added (e.g. About Us, etc)? and The Dreaded Drama Triangle (DDT) ™ are models that are Trademarked by the Bainbridge Leadership Center and The Power of TED*. The DDT is derived, with permission, from the Karpman Drama Triangle, developed by Dr. Stephen Karpman. Are you ready to move from living a life of scarcity to a life of abundance? To learn more, download your FREE copy of the Investor Awareness Guide and visit our Free Resources page to download our educational workbooks! To have them attain True Peace of Mind and a Life of Abundance.